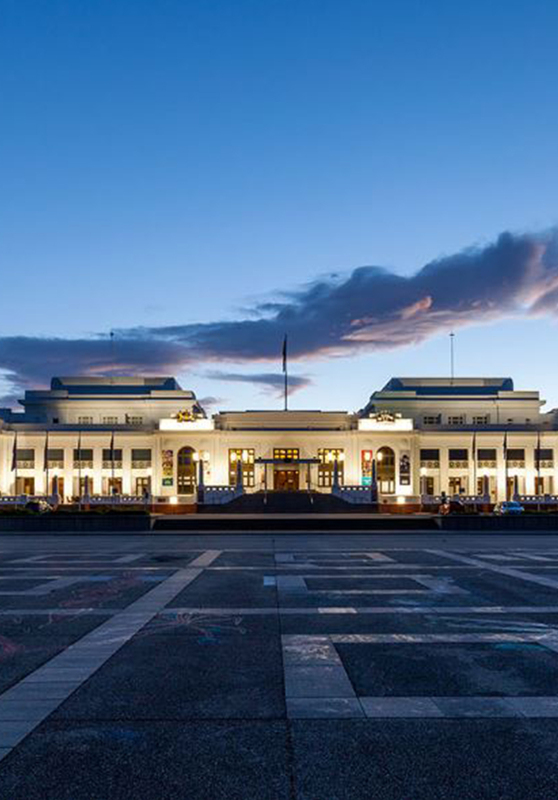 Old Parliament House (OPH) was the home of the federal Parliament from 1927 to 1988 and was designed by John Smith Murdoch, the first Commonwealth government architect. The building witnessed many significant events in Australia’s parliamentary and political history and is an iconic landmark in our democratic journey. From royal banquets and official state receptions to corporate conferences and galas alike, OPH has been host to it all. Refurbished to reflect its original grandeur, this renowned heritage-listed venue continues to provide a sophisticated and elegant backdrop for events of all styles. Hospitality and catering services at Old Parliament House are provided by Restaurant Associates . These services include café and restaurant management, catering, venue hire and event planning. The Restaurant Associates team at Old Parliament House are among the most skilled, innovative and enthusiastic in the industry. The team have years of experience creating diverse and creative client engagements that respond intelligently to the ever-evolving contemporary food culture. They understand what it takes to create extraordinary dining experiences in the perfect historic setting. Restaurant Associates are the in-house caterers for some of the most significant and prestigious organisations in the world including New York’s Guggenheim Museum, London’s Parliament Square, and iconic Australian venues such as Sydney Town Hall, Melbourne Museum, the Royal Exhibition Centre and the National Gallery of Victoria, among others. From corporate functions to gala dinners, our partnerships with local talents bring world class ideas to your table. With our on-trend food and impeccable service you can shine at your next event. Central to our success is our sense of community, our appetite for food provenance and a focus on sustainable food practices. Wherever possible we source fresh, seasonal, regional produce through our relationships with farmers, artisanal suppliers and providers. Whether it’s fine dining or relaxed café style, Restaurant Associates at Old Parliament House is about food that delivers on originality, quality and taste. “As passionate ‘foodies’ we don’t believe in cookie-cutter solutions; we approach each project or event anew, with our gourmet chefs crafting menus to bring your vision to life”. We love to create bespoke menus, talk to us about your ideas today. We are committed to helping build a strong and prosperous future for everyone, and this means making conscious and responsible decisions that are better for our health and the longevity of the earth that feeds us. Wherever we can we choose local, seasonal ingredients and we develop relationships with providers that source ethically produced goods. The versatile function spaces are perfect for many different sorts of events; small meetings of 20 to 400 guest dinners or 550 guest cocktails. We cater for all-day meetings, multi-day conferences, cocktails, dinners, weddings, school formals, Christmas parties, and more. Old Parliament House is also home to MoAD, an award winning museum of social and political history. MoAD is a museum not just of objects but of ideas, which tell the story of Australia’s journey to becoming one of the world’s most vibrant and multicultural democratic nations. The option of including MoAD in your event is a unique opportunity with the museum offering guided tours of 30, 45 or 60 minutes duration which can be tailored to your event and offered exclusively to your guests. These can include special interests or themes and offer a historic point of difference to your event, showcasing the national significance of the building. Tours can be organised for before, during or at the end of your event. Our team can assist with negotiated hotel rates should your event require accommodation for interstate guests. Please note that Restaurant Associates and Old Parliament House do not look after the Old Parliament House Rose Gardens outside the building. Those spaces are managed by the National Capital Authority who can assist you with any enquiries with these spaces. The Museum will occasionally consider hiring out other spaces upon request, such as the Heritage Kitchen or the Senate Committee Room. Please speak to your Event Coordinator about these options.